Beautiful range of hand-crafted, contemporary and traditional pendants sourced from around the world. From Pink Sapphire to smoldering Moldavite, from Siberian Blue and Green Quartz to Charoite - the keeper of the violet flame. A truly stunning collection. 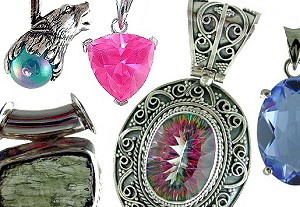 All of these pendants are ‘one-offs’ and as with all of our crystal and gemstone products, each piece is cleansed and blessed before being despatched and comes in a gift box.